Two years into the presidency of Donald J. Trump, U.S. foreign policy has undergone significant changes. Reversals on international agreements have left allies unsure of the durability of U.S. commitments. The Trump administration has often made foreign policy on impulse, whether unexpectedly agreeing to a meeting with Kim Jong-un, or pulling troops out of Syria. In Asia and globally, U.S. allies are in a difficult position, and it is possible the U.S. alliance system will emerge from the Trump era transformed. 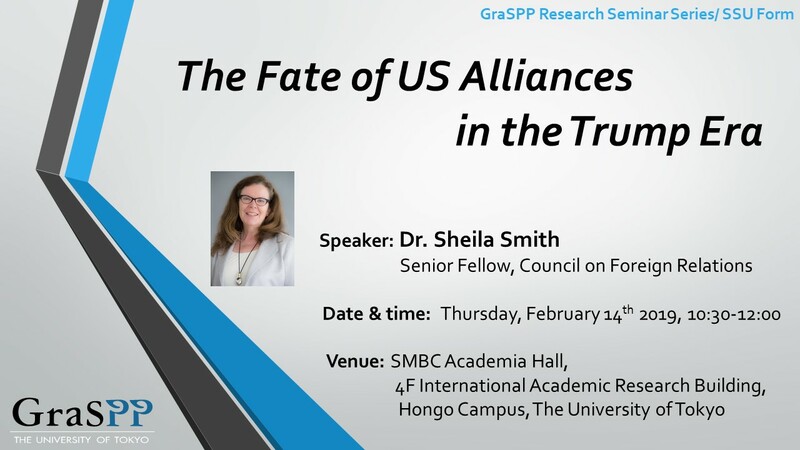 Sheila A. Smith, an expert on Japanese politics and foreign policy, is senior fellow for Japan studies at the Council on Foreign Relations (CFR). She is the author of Intimate Rivals: Japanese Domestic Politics and a Rising China (Columbia University Press, 2015), which was released in Japanese as 日中 親愛なる宿敵: 変容する日本政治と対中政 (Tokyo University Press, 2018), and Japan’s New Politics and the U.S.-Japan Alliance (Council on Foreign Relations, June 2014). Her current research focuses on how geostrategic change in Asia is shaping Japan’s strategic choices. In the fall of 2014, Smith began a project on Nationalism, Japan, and a Changing Asia.